Yup, an entire marathon dedicated to the best green guy around, a living cartoon! 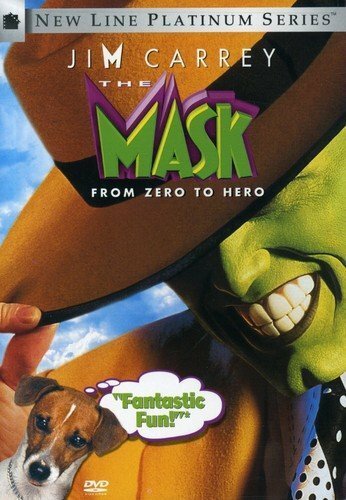 My marathon includes the live-action movie "The Mask" and it's sequel "Son of the Mask", all episodes of the animated series, and the rare episode, "The Mask: Animated End". Here is an opening of the series and a guide of what's to come just to give you an idea. - How Much is that Dog in the Tin Can? Well, this is what I plan on doing, hopefully before I go to my grandmother's house for the week. Wish me luck!! So THIS is why you wouldn't watch Spider-Man 3 with me? The Plot: Bank clerk Stanley Ipkiss is transformed into a manic super-hero when he wears a mysterious mask. My Thoughts: Well, this actually was really good, as about as good as I remember it. The dance scene at the Coco Bongo is a part that I always enjoy. You never hear music like that! Of coarse dearest daddy wouldn't know. 4 out of 5. Yes, I know, very generic, but these pics are hard to find!! So I'll probably have a lotta pics like this. And the episodes may not be in order because what one site says another says different. 1. The Terrible Twos Two boys gain superpowers and start wrecking the city. My Thoughts: Wow. The Fish Guy was definitely different than I expected, and Stanley being trapped alongside the detective made it all the more funny. "You know, it'd be a lot easier if I could just trap Calloway in cement a boot and throw him in the river, BUT since I can do that - "
2. Baby's Wild Ride A baby that Stanley was babysitting gets a hold of the mask and joins a biker gang. My Thoughts: Very interesting. I just-----wow, this show is hard to review!! Lol, anyone can honestly say "I never seen anything like it." When the baby had the mask, it was hilarious to see a biker try to take away his ice cream, and don't get me started on what happened when the boss tried to take his ba-ba!! 3. Shadow of a Skillit A creature steals shadows to stay young forever, asking the Mask to leave behind Stanley Ipkiss forever and come with him to his world. My Thoughts: Radioactive noogies!! Hahaha, this show, I can see already, is priceless. One thing comes to mind though. I haven't read the Mask comics, so I wouldn't know how this works, but is Peggy supposed to be Stanley's friend? Cuz in the movie she betrayed him, so, yeah, just wondering. 4. Sister Mask In an attempt to control the Mask, Stanley puts on an additional "Sister Mask" found in a museum but soon finds it was a ploy by Pretorius to control the Mask's body. My Thoughts: A little disappointed this wasn't about Peggy getting the Mask , but still very good. And hilarious. The dude wanted to steal a meteor rock. Let me walk you through this. That one turned people invisible. The rest make people stretch, strength by rocks, and be covered in flames. So the dude wants to recreate the Fantastic Four?? 5/6. The Mask is Always Greener on the Other Side Stanley buries the Mask thinking it causes him nothing but trouble, but then Pretortious returns seeking revenge on Stanley Ipkiss. My Thoughts: This two-parter was pretty good, and it solved one mystery for me. Peggy mentioned betraying him once before, ergo, the movie. Still, I gotta ask, what about Tina? Hmm....guess she got back into habit with the mob. Oh well. It was cool to have a little scene with the neighbor's baby w/ the Mask again. lol Still, the whole "It's a Wonderful Life" theme is sooooo overdone, but you can barely notice. good show! 7. Bride of Pretorius Pretorius returns to kidnap Stanley's date for a new body after she put on the Mask. 8. Double Reverse Stanley starts to act like the Mask as reverse psychology to make his life better. My Thoughts: Some great laughs here. "That's it? The man's got gas?" The fact the man could get a date and a promotion cuz of him acting wacky is weird enough, but a man who calls himself an unpopable balloon? Definitely one of the crazier episodes. 9. Shrink Rap Stanley's psychologist, Dr. Newman, put on the Mask and "diagnoses" the whole town, then teams up with Pretorius. My Thoughts: Bizarre. During the episode I finally came to realize a difference between the cartoon and the movie I should have seen before. The Mask works during the day in the cartoon? I don't know how it worked in the comics so I'm not sure whether this is considered a good thing or not, so not my place to judge. Still pretty good. Pretty below average for the show, but still good. 10. Mayor Mask The Mask runs for Mayor against the Mayor Tilton on election day, who is really Pretorius disguising himself as the Mayor. My Thoughts: Wow, can you guys imagine what would happen if the Mask was elected mayor? Limbo in City Hall!!! Hahaha, very entertaining episode. I never enjoyed the cartoon of the Mask very much... Have you read much of the comic? I always preferred that. 11. Martian Mask Putty Thing and Fish Guy escape as the Mask is being pursued because government officials think he's an alien. My Thoughts: Wow, return of the "Terrible Two", huh? Wow, as overused as I noticed him being in this series I'd actually prefer it be Pretorius again. I mean, every time I see Fish Guy, I just wanna fry him up, and I don't even LIKE seafood!! My feelings of the criminals aside, haha, this was actually a pretty good spoof of E.T.! Especially the ending! Looks like Calloway got a space wedgie!! No Emma, as I mentioned in some of the posts, I never actually got my hands on any of the comics. I'd like to though!! 12. How Much is that Dog in the Tin Can? Milo uses the Mask to save dogs being held captive to taste test chili. My Thoughts: CHILI DOG!!!! Haha, sorry, couldn't help myself. This is one of the even more comedic episodes in my opinion. The criminal one-way romance, the chili with dogs, wow!